Black Hills Gold Stackable Bands Set in the Black Hills Gold Jewelry style. Petite Hand-Engraved, Hand-Placed, Satin Finished 12k Green Gold Grape Leaves and 12k Rose Gold Grape Leaves on10k gold shank.Petite Hand-Engraved, Hand-Placed, Satin Finished 12k Green Gold Grape Leaves and 12k Rose Gold Grape Leaves on10k gold shank. Top Width Measures approx. .25" inch. Whole Size (5, 6, 7, 8, 9) Rings Usually Ships in 20 Days. 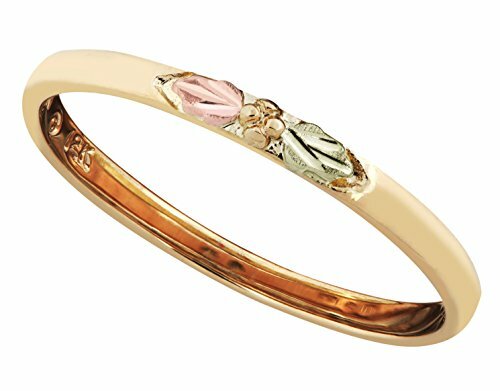 Petite Hand-Engraved, Hand-Placed, Satin Finished 12k Green Gold Grape Leaves and 12k Rose Gold Grape Leaves on10k gold shank. etite Hand-Engraved, Hand-Placed, Satin Finished 12k Green Gold Grape Leaves and 12k Rose Gold Grape Leaves on10k gold shank. Top Width Measures approx. .25" inch. Whole Size (5, 6, 7, 8, 9) Rings Usually Ships in 20 Days.